I'm really enjoying this band at the moment. Just bought a copy of Shopaholic and also purchased their single, Happens Everyday, a while ago (available on my blog). It's a shame they were forgotten about because they really are quite special! Do you have anything else by them? That's funny. I just tracked down the CD about a month ago as I couldn't find the album posted anywhere. I think "Mannipple" is my fave track. This is an excellent album. I remmeber it from my Uni days back at the end of the 80's and seening them live. In fcat just had all my old CD's shipped from the UK to New Zealand where i Live now. Must dig it out and have a listen. I just wanted to say, it's nice to see someone write about this underappreciated band! where to get the CD let me know, as the LP is quite scratchy now. My dad was one of the Wood Children!We live in Canada now and I showed this to him and he thought it was really neat to have a blog written about his band (although i'm not sure if he knows what a blog is!) I knew about his band but I never actually knew they had fans! They played in London and area four years ago.. I'l try to convince him to go back! is that Richard?I met him on the tube , he was rather lovely.I have the CD now and its fantastic, though I may be biased as its the soundtrack to my 19 yo life.Ah.Can you work on some more gigs? 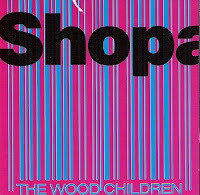 Great memories of The Wood Children, saw them at Northumria Uni in 1990 when Sweets For The Blind came out, loved them and their records remain treasured possessions, especially a signed 2nd hand copy of shopaholic I once picked up which had a poster, 3 photos from Lyon, set list and photocopies of melody maker reviews in it! Someone let a gem go there. I was an in London in the fall of 1989 and travelled with the Wood Children to Nottingham for a gig. They played in the basement of a posh restaurant. They were tight. Back in the day my band Surreal Madrid did a gig as support for the Woodchildren and Baby Snakes at the Bull & Gate in Camden. They were brilliant live. I'm now sorting out my record collection, came across the and wondered what ever happened to them ? Saw them at Sheffield Poly in 1989. I was exposed to loads of bands as I worked as a DJ/Stage hand at the Poly but they stood out as a fantastic live band and ended up staying on our floor. Saw them again that tour in Manchester (Boardwalk?. Never got hold of the first album - must try and track it down. Shopaholic was a great album. Good bunch of guys to. Saw them in the Underworld and some club in Bath, and showed Richard around Oxford once - I ended up swapping my guitar for his bass. Happy days. "Epitaph for Miss World" remains one of my all time favorite songs. Loved this band in the eighties, but desperate to download Sweets For The Blind - used to have the vinyl but misplaced it somewhere in the intervening 20 years. Moving to Australia probably didn't help. Anyone have a link? Hi Vicky, that's mightily kind of you. My email is timdotmuiratgmail.com (the at is an ampersand but that first dot really is dot - sorry for the confusion but trying to avoid my address getting harvested). Many thanks, Tim. "Father, help me, please. I've got this tropical disease (that) I don't want to carry." The Wood Children have been big on my list of 'things which are just damn good' since John Peel put them on the radio 1980ish. Constantly listenable. I also saw them at a gig in the then Liverpool University Union. Fantastic. Unique. does anyone know the WC track that strat something like "i used to love that boy but now he is a girl" ? OK sorry to go off topic a bit but is that the Ball-y above I know?Chester House?This site is causing me no end of strangeness so it wouldnt surprise me.Get in touch you old slapper. Can remember buying the vinyl of Shopaholic from Birmingham HMV after it got a 4 star review from Q magazine, back when Q was a reliable guide. They were right too. They briefly threatened to become a sizeable indie band but never did, sadly. "There's a man in Timbuktu who's never heard of Bob Monkhouse". Looking for this. Is a repost possible? Simon/CP - the line in ‘Imaginary Trap’ is as you remember, except ‘jeans’ is actually ‘genes’ as it’s about “a boy becoming a girl”.